Vegas Mania Video Slot Review - Casino Answers! 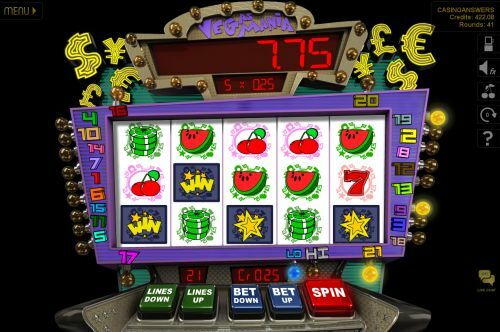 Vegas Mania is a 5-reel, 21-line video slot developed by Slotland, featuring a wild symbol, multipliers, a free spins feature and a progressive jackpot. You can play the Vegas Mania video slot at Win A Day Casino. Bets on the Vegas Mania slot machine are $0.02, $0.05, $0.10, $0.25, $0.50, $1, $2 and $4 per line. You can use the “Lines Down” and “Lines Up” buttons to select up to 21 paylines on the Vegas Mania slot game. The minimum total bet on Vegas Mania is $0.02 per spin and the maximum total bet is $84 per spin. Vegas Mania has a good betting range that should suit most online slots players. To play the Vegas Mania video slot, select your bet and press the “Spin” button. Vegas Mania is linked to a casino-wide progressive jackpot, which is currently at $34,114. To win this progressive jackpot, you must be making a total bet of $5 or higher and land 5 Horseshoe symbols on a selected payline. If you are betting less than $5 on a spin, you will instead win the 1500 coin top fixed payout. Vegas Mania has two wild symbols – Wild and Double Wild. Both symbols will substitute for all other symbols except for the scatter symbol. Wild symbols themselves do not constitute a winning combination. The Double Wild symbol is a wild multiplier that will act as a 2X multiplier. The prize can only be doubled once. 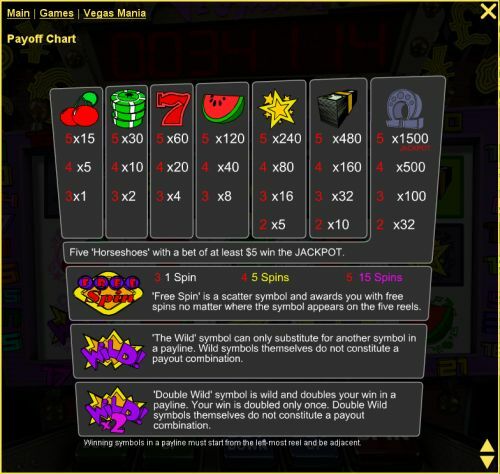 The Free Spin symbol is a scatter symbol and awards you with free spins no matter where the symbol appears on the five reels. 3 Free Spins symbols will award you with 1 free spin, 4 will give you 5 free spins and 5 Free Spins symbols can win you 15 free spins. You can increase your winnings big time by winning free spins on the Vegas Mania slot game at Win A Day Casino! Vegas Mania has a basic autoplay mode that you can use. Click the arrow symbol near the top right part of the screen to open up the autoplay mode options. You will be able to select 5, 10, 25, 50 or 100 autoplay spins. You can speed up the gameplay by skipping animations on winning combinations. Triggering the scatter feature or the bonus game will bring the autoplay mode to a halt. You can stop the Vegas Mania autoplay mode at any time by pressing the autoplay mode button. Vegas Mania is a decent no-download video slot with a few somewhat basic special features. You can try the Vegas Mania video slot out when you sign up and play at Win A Day Casino! Are USA players able to play the Vegas Mania online slot for real money? Yes, Americans can play the Vegas Mania video slot for real money exclusively at Win A Day Casino. Can I play Vegas Mania Slots in my web browser for free? Yes, Vegas Mania is played only inside the web browser using Flash. You can play for free or use real money. If you experience difficulties with the flash casino, we recommend that you download and install the latest version of Adobe Flash Player.